The Community Challenge consists of teams that engage in friendly competition against each other in a variety of intellectual and physical challenges over the course of several days. 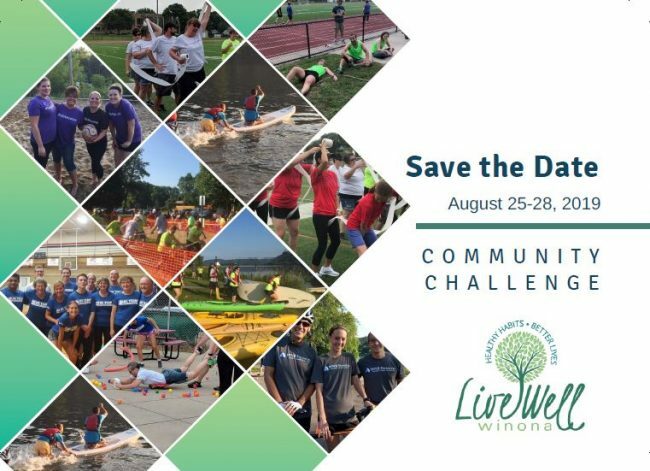 We invite community businesses and organizations of Winona to rise to the challenge and put their teamwork to the test! This Olympics-style event puts the “fun” back in fundraising, with proceeds benefiting Live Well Winona. We have a small division for companies with less than 50 employees, and a large division for companies with 50 or more employees. Teams can be comprised of employees, family of employees, clients, or vendors of the business or organization. Participants can only represent one team throughout the challenge, but may participate in multiple activities. All team members must be 18 or older. CONGRATULATIONS to all our past winners! We appreciate your support and participation. Our winners in each division receive an engraved traveling plaque to display proudly!